Edwards honorary commanders visited Hanger 1600 where a presentation was given about load crews by Senior Master Sgt. Joseph Armijo, 412th Aircraft Maintenance Squadron Wing Weapons manager. Community leaders and their guests visited Edwards Air Force Base in Southern California through the Honorary Commanders Program May 11, 2018. Every quarter, honorary commanders are invited for an exclusive look into different command groups on Edwards. This time, the honorary commanders and their guests were hosted by Col. Stephen Grotjohn, 412th Maintenance Group commander. The Edward’s Honorary Commanders Program builds awareness of the daily work done at Edwards and also develops working relationships between the base and local community leaders. Community leaders hold their position in the program for two years. The group began the day with a visit to the munitions flight where they began the tour in the munition storage area where bombs are kept. Personnel are specially trained to handle bombs ensuring they are always safely handled. “We’re very meticulous about ammunition safety,” said Margaret Fleming, 412th Maintenance Squadron director. The group also had the opportunity to see where bombs are assembled. There are numerous types of bomb components creating different effects. The type of nose and tail used on a bomb depends on the target. 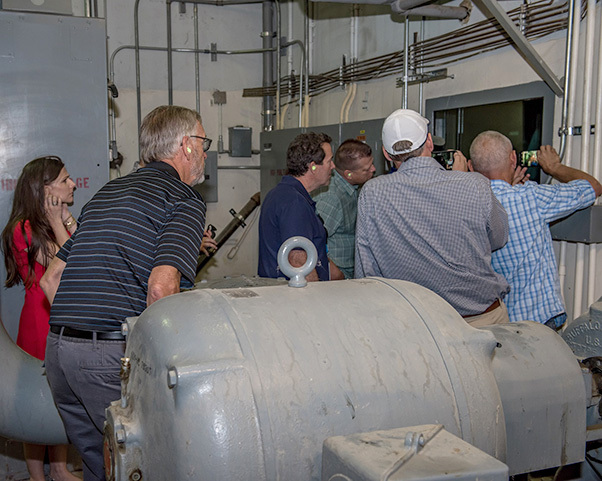 Next, the group visited the test cell, which is a multifunctional facility able to run different types of jet engines. The facility was built in 1955. Engines are ran in the test cell facility to determine if there is a problem before maintenance is conducted. After the work is completed, the engine is run again to ensure all problems have been corrected before being reinstalled on an airplane. The commanders learned how engines are placed on a test stand and air is drawn into the intake of the engine. 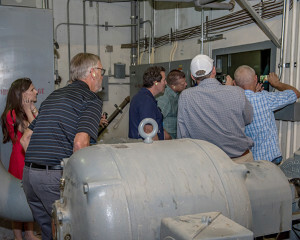 The exhaust goes into a pipe that defuses the heat when it reaches approximately 700 to 800 degrees then water is added. The water cools the exhaust creating steam as the engine runs. Honorary commanders watch a test run of a jet engine. Engines are run in the test cell facility to determine if there is a problem before and after maintenance is conducted to ensure all problems have been corrected before being reinstalled on an airplane. They are able to measure thrust, pressure, temperature and vibration of a jet engine in the test cell. Cameras record the test in case of catastrophic failures of the engine. 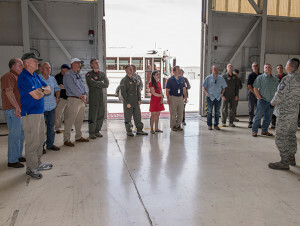 The group then visited Hanger 1600 where a presentation was given by Senior Master Sgt. Joseph Armijo, 412th Aircraft Maintenance Squadron Wing Weapons manager. According to Master Sgt. 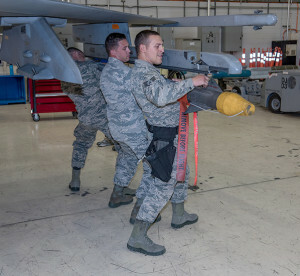 Jason Buffell, weapons superintendent, there are about 285 weapons personnel that are either qualified or trained to load weapons onto a B-1, B-2, B-52, F-15, F-16, F-22, F-35, MQ-1 and MQ-9 aircraft with over 35 munition variants. Personnel are divided into a fighter crew or a bomber crew. The honorary commanders were shown different types of bombs. A fighter weapons crew consisting of Staff Sgt. Robert Wagner, Staff Sgt. Michael Meyer and Staff Sgt. Cody McCloud loaded an AIM-9X short-range, air-to-air missile onto an F-16 Fighting Falcon. The 200-pound missile is loaded manually and it’s imperative to load the weapon quickly and safely to be mission ready. A fighter weapons crew consisting of Staff Sgt. Robert Wagner, Staff Sgt. Michael Meyer and Staff Sgt. Cody McCloud loaded an AIM-9X short-range, air-to-air missile on an F-16 Fighting Falcon. The 200-pound missile is loaded manually and it’s imperative to load the weapon quickly and safely to be mission ready. Next on the schedule was a tour of the 412th Aircraft Instrumentation Test Squadron. Steve Ewart, squadron director, showed examples of airplanes needing some type of modification. Modifications can be identified with orange parts and wiring. Every airplane is unique and different so no one system will fit every airplane, according to Ewart. Edwards test aircraft routinely need to collect and send data from test sorties and special equipment needs to be installed on the plane. The color orange indicates the part(s) are not original to the plane. The collection of data is the primary mission at Edwards. 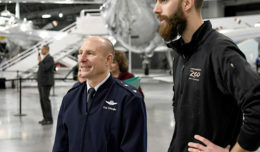 The honorary commanders were then given presentations by the electrical engineering and mechanical engineering shops explaining how they design one-of-a-kind components for aircraft, which concluded the “maintenance for flight test” tour.